I can’t remember the last time I felt this excited about discovering a new artist. Of course, I didn’t “discover” Xavier Rudd, but in terms of my own music library he is the newest and best addition. I knew I really liked his chill yet funky sound when I downloaded his newest release, White Moth, but I was absolutely blown away seeing and hearing him live. 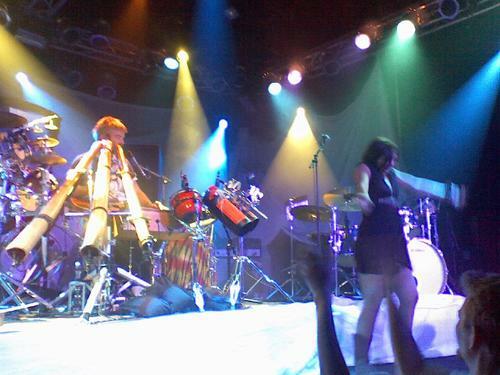 Getting your groove on at a Xavier Rudd show comes with the territory. It’s virtually impossible to stand still and not let the energy of his live show take over your feet…and legs and hips and arms. Reject the dancing, and you would’ve been better off posting your ticket on Craigslist the night before. Rudd is an incredible singer/songwriter and multi-instrumentalist from The Outback whose sound is a blend of folk, rock, reggae and world music. Forget the latest technology that lots of artists are using these days to loop guitar riffs live on stage for bigger sounds. While that’s an impressive skill in its own right, Rudd is, shall we say, more au natural in his musical approach….from the instruments he plays and how he plays them to his spiritually and environmentally aware lyrics. He’s an embodiment of pure, multi-faceted talent. 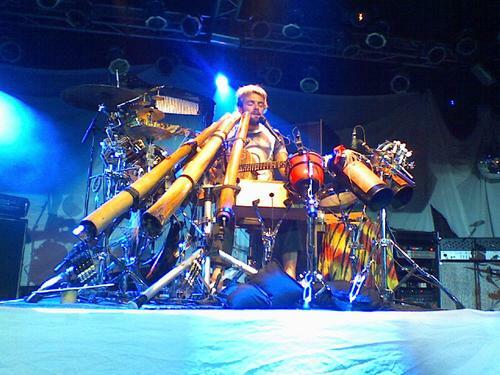 Perched on the stage surrounded by his various instruments, Rudd creates unique, complex sounds by playing many of his musical apparatus simultaneously, almost as if they’re extensions of his own body. His set up includes guitars, Weissenborn slide guitars, stomp boxes, djembes (skin covered hand drum) cascading sticks and cymbals, harmonicas and, perhaps the most unique of all, 3 didgeridoos (long wooden wind instrument of the Indigenous Australian people). Hard to imagine that he plays 3 of these at the same time, right? Oh, and did I mention that he sings too! As his henna-like tattooed feet (looks like this barefoot thing is becoming a trend with me) are tapping out the beat, his arms and hands are flailing around his collection of percussion instruments or various guitars. All the while, he’s droning on a didgeridoo, blowing out a harmonica or using his mellow voice to pay tribute to the world, land and people around him. What I’d do to be this coordinated! However you want to categorize Rudd’s sound (though you’re probably better off not even trying), there’s no denying it’s good, and his live shows are huge…filled with great positive energy and amazing music. As either my concert buddy or blog supporter (many thanks to both), you know that I’m a lover of small, intimate venues…so you can imagine how psyched I was when I got to Highline Ballroom and realized it was more of a club than a concert hall. The two level space comes complete with bar in back and tables and chairs upstairs for those more laid back fans who don’t feel the need to compete from prime spottage in front of the stage. Clearly, I wasn’t sitting up there. I knew it would be a great night when at press check-in I was told that I was on the band’s list….aah, to say I’m “with the band” just once, even if not completely true, makes me giddy………..but, back to the show. With 20 minutes left before show time, my pre-concert stress of securing close stage proximity was in full effect (5’1 at a GA standing room only show…not so ideal). I took advantage of the somewhat dispersed crowd that was busy either socializing or making beer and bathroom runs between the opening and headlining sets, and I zigzagged my way right to the front. If I’m able to rest my elbow on the stage, I can concede that I’m close enough. Content with my location, I allowed my better half and go-to concert companion to get a well deserved beverage and even visit the lavatory if absolutely necessary while I protected our seemingly unthreatened spots. And good thing I did, because as soon as the lights went down and the mysterious black sheet on stage was removed to reveal Rudd’s extensive instrumental set-up, the rest of the previously distracted crowd came a runnin’ back. Rudd is the anti-looking rocker. With shaggy blonde hair, a psychedelic tie-die t-shirt and no shoes he looks more like an extra from Point Break than the tremendous musician he really is. But his energy on stage is electric and infectious. It’s obvious that he feeds off of the enthusiasm in the crowd…smiling over his stand of didgeridoos as he watches and listens to the crowd dance and sing along. As awe-struck as we are to witness such enormous talent, he seems equally blown away when he sits back for a second mid song and almost laughs, realizing that his music is more than catching on. Pinpointing Rudd’s sound is a futile attempt, as he’s often said himself in interviews. There are songs like opener “Fortune Teller” and “Chant” that have such hypnotic drum beats that you can feel your body bopping up and down in sync almost as if it has a mind of its own. Then there’s reggae inspired tunes like “Twist” that make you feel as if you’re jammin’ down in the Caribbean rather than in a small club in The Meat Packing District (too bad the crowd’s requests for “No Woman No Cry” were never answered). “Message Stick” definitely highlights Rudd’s Australian roots, with grumblings through the didgeridoos and chants that seem to replicate the sounds of Aboriginal tribal dances. “Conceal Me” was probably one of my favorites of the night—a really high energy song that compelled you to get some air between your feet and the floor. 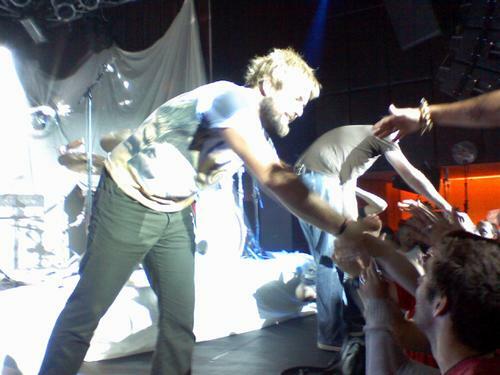 And upon catching the eye of one very animated and might I say sweaty fan, Rudd gave her the ok nod to climb up and bring her moves onto the stage. Unfortunately for her, her dancing debut was cut short by an inebriated gentleman who clearly misinterpreted Rudd’s private invitation as an open one to the entire crowd. Finishing an extended instrumental jam with an Ozzy Osbourne “Iron Man” tease couldn’t have been more perfect. I can’t not mention the other musician on stage too, who complimented Rudd’s versatile musicianship with a full rock and roll drum set for most of the show. But perhaps the best guest appearance of the night came from Rudd’s pseudo guitar tech who switched and tuned his boss’s didgeridoos in between songs. Somewhat shyly stepping out from the sidelines, he plugged in his banjo to accompany Rudd for a brief stint during the encore. Talk about a jack of all trades! Regardless of the “genre” each song may or may not best represent, there’s an underlying spirituality that comes through Rudd’s upbeat songs and particularly in his simple yet insightful lyrics about the environment, humanity and family. This would be looking surfer from the Aussie coast definitely has profound things to say if you take the time to listen and not just dance, hard as that might be. His connection to the world and people around him is obvious, explaining in reference to his didgeridoos that it was “an honor and privilege to play with this spirit.” Songs like “Messages” and “Footprint” speak to the dangers and damages of global warming while new single “Better People,” which he aptly saved for the encore, pays homage to earthly activists out there doing their best to actually save the land and not just sing about it. As if he doesn’t sound perfect enough, Rudd’s a romantic to boot. When he came out for his 5 song encore, he dedicated the lullaby “White Moth” to his beautiful wife who was watching from back stage. 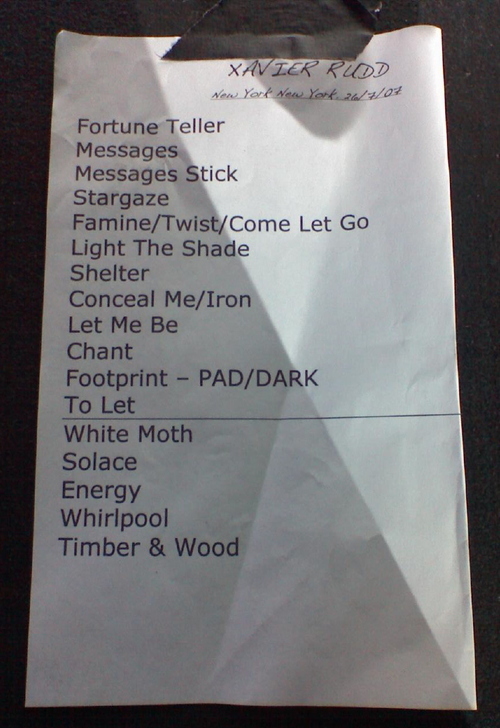 FINALLY, after about 2 hours of chants for “Jack,” Rudd answered the fans’ prayers by closing the show with the top requested song of the night. I’ve never even heard this song, nor do I even see what CD it’s on now that I’m back home, but the cheering was contagious. Before long, the group I was standing with looked at each other, shrugged and joined in with the mantra: “Jack,” “Jack,” “Jack.” Can someone please tell me who Jack is?? P.S. : To my DMB friends out there who are hitting up the early August shows— PLEASE do yourselves a favor and go in to check out Xavier Rudd. You won’t be disappointed! Great show and you were right on about the energy and musical talent of XR. Those digeridoos were very cool too. I gotta get me some of those. His setup looks AWESOME, great review! I will definitely download this dude... thanks for another awesome review. those instruments are crazy! def. will have to check him out! you should be his writer! reading your review makes me really want to check this guy's music out - thank you for another exciting write-up! Glad you loved the show, he's awesome, maybe we'll guest with dmb while he's on tour with them. This show sounds awesome Leslie!!!! Your totally turning me on to all kinds of new music and bands!!! Well done!! Cant wait to see you in a few weeks! Sounds like a good show. Great review! Great review. I'll give him a listen for sure. I am so excited to see Xavier open for Dave in Hartford. Great review Leslie! Xavier opens for dmb on a lot of shows this year so I was excited to read your review in hopes to see him as an opener this year. Thanks. Hey! Lou and I have had the pleasure of seeing Xavier quite a few times and your review of his show sums him up beautifully. He is truly one of the most talented and unique musicians of our time. He really does blow your mind. All you posters out there, Lindsay nailed it spot on the head, if you haven't seen him yet, do yourself a huge favor and check him out! OMG - So sorry Leslie.. I was multitasking and e-mailing my friend Lindsay about her engagement party... sorry to type in the wrong name. DOH! I'm Jack. But I don't think the crowd was chanting for me. Too bad. Another great review Les. This time the pictures were an absolute and important feature. For a second there I thought Mr. Rudd had two or three mouths given how many instruments he was working. Keep up the great writing. Sounds awesome!!! I've never heard of this guy, but I will definitely check out his stuff soon! I'm really excited to check this artist out. Great job with the detailed review. Great write up, I will be sure to check out his material and a show if I ever have the opportunity. Thanks for the solid review. Sounds great! I also like the fact that you mentioned Point Break in your review! Great write-up Leslie! I just downloaded 2 of his songs after reading this. Great pics and another solid write up! This guy looks great. I will have to check him out. Never seen a stage with one person and that many instruments....NUTS!